To operate effectively in today’s dynamic global real estate markets, it is essential to understand the complex processes that underpin them. This up-to-date work, which brings together contributions from industry and academic experts from around the world, is a valuable corollary to effective investment decision-making within the property sector and will be of interest to post-graduate property students, researchers and practising real estate investors. Recent years have seen some rapid developments in the global scale and structure of real estate markets. Such transformations have been paralleled by significant changes in the financial structures, and processes that serve these markets, including sophisticated new investment and finance structures and products. Examples of these include the real estate investment trusts (REIT) products that have been developed in USA, Europe and Asia, the range of unlisted products emerging in UK and Europe, and the innovative financing structures being developed in many countries. 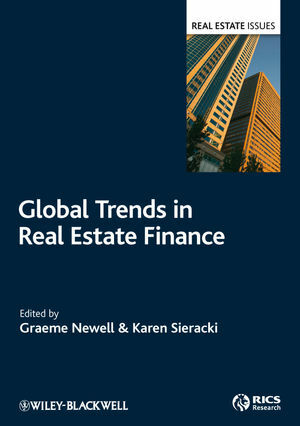 Global Trends in Real Estate Finance addresses this emerging complexity and sophistication in contemporary real estate markets by discussing the history, merits and implications of a range of products and processes. Also examined are the changes in the practices and environment needed to ensure the success of these property products, including increased disclosure, corporate governance, market transparency and improved skills base. Chapters are written by leading international contributors, both academic and practitioner. The context is explicitly international, with a focus on UK, Europe, Asia, Australia and the USA. The aim is to identify specific market areas to describe the key innovations, rather than simply providing a description of various geographical markets.